A food drive sponsored by NBC 4 New York, Telemundo 47, Stop & Shop and food pantries across the tri-state region brought in more than 240 tons of food — enough for 1.9 million meals for local families in need. 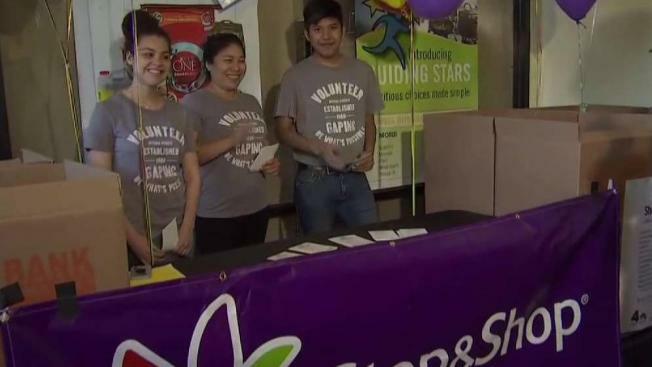 More than 250 local Stop & Shop stores in New York, New Jersey and Connecticut took part in "Feeding Our Families," which took place for the second consecutive year. The food drive collects non-perishable supplies to help end hunger. Last year, the stations' first Feeding Our Families food drive generated 900,000 meals and more than 120 tons of non-perishable goods for local families in need. Food banks face periods of greatest need between January and August — a time outside of traditional periods of giving and volunteering that coincides with the holiday season. Non-perishable items are requested by families daily, but the most frequently-requested items are those not covered by public assistance programs. These requests range from baby diapers to personal hygiene items such as toilet paper, tampons and more. “WNBC is committed to fighting hunger and making a difference in every community we serve. On Saturday, we did just that. Together with our partners at Telemundo 47, we launched a massive, one day call-to-action unprecedented for our stations in both size and scope. I would like to thank our viewers for participating and donating; nearly 2 million meals will now be delivered to local families in need,” said Eric Lerner, president and general manager of NBC 4 New York. “Alimentando a Nuestras Familias was the largest, most successful community initiative in our station’s history. Working together with WNBC and our partners at Stop & Shop, our viewers’ generosity will help our area food banks, families and children. The results are truly remarkable and will make a difference for so many across our region,” said Cristina Schwarz, president and general manager of Telemundo 47. On the day of the food drive, more than 1,000 volunteers, including anchors, reporters and staff from NBC 4 New York and Telemundo 47, as well as Stop & Shop associates and representatives from local area food banks helped to collect non-perishable goods at Stop & Shop’s Tri-State locations. Stop and Shop also donated $50,000 to support the work of the participating Tri-State food banks. “Stop & Shop was proud to support the 2018 Feeding Our Families / Alimentando a Nuestras Familias food drive in partnership with NBC 4 New York and Telemundo 47 in 254 of our store locations throughout New York, New Jersey and Connecticut. We would like to thank our customers, associates and volunteers for making the drive such an overwhelming success which will help so many of our neighbors facing food insecurity.,” said Phil Tracey, Stop & Shop director of community relations.